While staying at Pepperclose Cottage for a luxury self catering holiday near the coast, why not sample some of Northumberland's finest beaches? The coastline in Northumberland is some of the most spectacular in the UK. Unlike many parts of Britain, there are still uncrowded, room-to-breathe and unspoilt beaches in Northumbria - often stretching for mile after mile, with hardly a soul in sight. The sight of red-sandstone Bamburgh Castle, standing on a rocky outcrop above a magnificent beach of clean white sand, is breathtaking. The walls and rocks below form a 150-foot precipice. Most of the visible parts of the castle were built in the 18th and 19th centuries, when it was used as a boarding school to train servant girls. The first fortification was built in AD 547 by King Ida and was rebuilt by the Normans. The castle is open daily, mid February to end October and weekends only November to mid February. North of the castle a cliff-top lane leads to a small lighthouse. 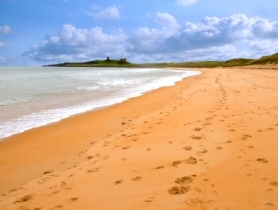 The sandy beach, stretching southward to Seahouses, is studded with rocky reefs, but there is safe swimming away from the rocks. The village of unpretentious and charming sandstone houses is best known for its heroine, Grace Darling, who was born in 1815 in a house opposite the church and died of tuberculosis at the age of 26 in a house that is now a gift shop. At the height of a storm in 1838 Grace rowed an open boat to the rescue of shipwrecked sailors. The 21-foot boat in which (with her father, a lighthouse keeper in the Farne Islands) she saved five people from the wreck of the steamer Forfarshire is displayed in the Grace Darling Museum, which is open daily from Easter to the end of September. One of England's most breathtaking beaches and only three miles from your cottage, this is undoubtedly one of the finest beaches in the country. With apricot-coloured sand, towering dunes and views to the dramatic medieval ruin of Dunstanburgh Castle, you will rarely find such a dramatic setting. Its giant dune system shelters some quaint thirties summer houses; indeed Embleton seems lost in a time warp, and is still totally un-commercialised thanks to the protection of the National Trust. It's magical! There's also an intriguing collection of wartime pillboxes, which remain only because access across the adjacent golf course was denied to the demolition gang. Arm yourself with a tide timetable to plan the best time to visit this small sandy beach sheltered by about three kilometres of rocky reef running parallel to the shore, which is exposed at low tide. It has deep gullies and pools and many overhangs, and is thickly grown with all the most familiar inter-tidal seaweeds and rich in every kind of marine invertebrate - especially animals that are permanently attached to the rocks, such as sponges, bryozoans, sea firs and the soft coral, dead-man's fingers, aconitum digitatum. Enclosed by the best surviving Elizabethan town walls in Europe, Berwick is attractively situated on the northern shore of the wide mouth of the River Tweed. But it is the three bridges spanning the river that catch the eye. The present Berwick Bridge was begun in 1611. It carried the Great North Road until 1928, when the graceful concrete arches of the Royal Tweed Bridge were built alongside. Upstream are the tall, slender arches of the Royal Border Railway Bridge, opened in 1850 as the last link in the London to Edinburgh railway. Between 1147 and 1482, in the border troubles between England and Scotland, the town changed hands 13 times. Its walls, over a mile long and 22 feet high, have been preserved intact since they were completed on orders from Elizabeth I, circa 1560. Access by path across links grazed by cattle and sheep to a spectacular sandy beach with safe swimming and little more than a farmhouse within three miles in any direction. North of Belford, with Bamburgh Castle at one end and Lindisfarne at the other, this has been called the most spectacular beach in England. It is well worth the effort to visit Ross and it is only 20 minutes drive from your cottage. The views are spectacular and there is a mass of birdlife to see. This is some of the most protected coastline in the UK with numerous SSSI's and when one visits it is easy to see why. This low-lying island, whose ancient name was Lindisfarne, was the cradle of Christianity in England. St Aidan founded the first English diocese here in AD 635. The castle, on a knoll near the foreshore, was built c.1550 and restored as a private dwelling in 1900. Owned by the National Trust, it is open between 10.30am and 4.30pm, subject to tides (except Fridays) from April to October (Wed only in June) and on certain other days indicated by a flag hoisted above the castle. The ruined 11th-century Lindisfarne Priory is open daily. This shallow estuary fills with water only at high tide, when the sea flows around the sand bar at the entrance. Swimming is extremely dangerous here. The marshes are frequented by many types of wildfowl and are part of the Lindisfarne National Nature Reserve, which protects the dunes and wildlife in the area of Holy Island. East of the hamlet of Waren Mill, on the B1342, is a grassy roadside area, fenced by white rails. From it there are views over the marshes where birds, such as duck, pink-footed goose and oystercatcher, can be seen feeding. Sandy cove set in extensive rocks that skirt the headland and are exposed at half-tide. Access to the cove is by road from Low Stead Farm. This is a private little beach well worth a look. Bounded on three sides by a loop of the attractive River Coquet, and centred on the ruins of the 12th / 14th century castle mentioned by Shakespeare in Henry IV, this quiet town of grey stone houses is one of the most attractive in the North East. Half a mile up-river from the castle (open daily) is a 14th century hermitage and chapel cut into the cliff; it can be reached by hired boat. A boat trip on a warm day is great fun and very attractive. When I was younger a few drinks in the Hermitage Inn and then a row up the river with a bottle of wine was one of my regular courting techniques! Incidentally, the old bridge in Warkworth, built in the 14th century, is one of the few remaining fortified bridges in the country. Built as a coal port in the 19th century, the harbour area has been attractively restored and now has one of the county's largest fishing fleets. Between May and August boat trips operate from the old harbour. Nearly five miles of magnificent beach backed by low sand dunes. It is a vast deserted bay and a good place for a long walk with firm sand and few natural obstructions. That's it folks: a definitive guide to the main beaches of Northumberland; there are some excellent beaches, as good as any you would find anywhere in the world.